The digital tools dedicated to those who love to travel keep increasing: the apps dedicated to tourism enable users to book planes, hotels, collect information on tourism destinations, finding places of interest, interactive guides and multimedia always available. BeepUp derives from the team’s primary goal: improve the travel experience. How? Offering the tourists with a tool capable of matching travel itinaries with the interest of the users, suggesting paths depending also on the time time at tourists disposal. Thus, BeepUp is a multilingual mobile application, available on Android and iOS, that enables users to discover the artistic and cultural resources of a city and receiving tourism information in real-time, avoiding early planning. For example, if a tourist wants to visit Seville, s/he can select the themes related to the places s/he wants to discover during his/her stay, receiving an alert everytime s/he is next to one of them. If the user selects the filter “Culture”, BeepUp finds all the churches and museums of the city. In case s/he passes next to Plaza de Espana, s/he will receive a “beep” communicating that s/he is close to a place of interest. This is one of the main features of BeepUp: through the aggregation of data coming from different web sources, (Wikipedia, Google, Tripadvisor ecc. ), BeepUp warns users with a push notify with all the information related to the place of interest where s/he is. In the aforementioned example, the tourist will read/listen to all the information related to Plaza de Espana. These notifies result in an increased accessibility and quick selection of information on the city. This will enable a valorization of the city tradition, especially non-popular places visited by friends, giving a wide range of possible choices of what to sightsee during one’s trip. TraDISHon is a mobile application that transforms how you learn about traditional food and wine, with everything you need to know at your finger tips. 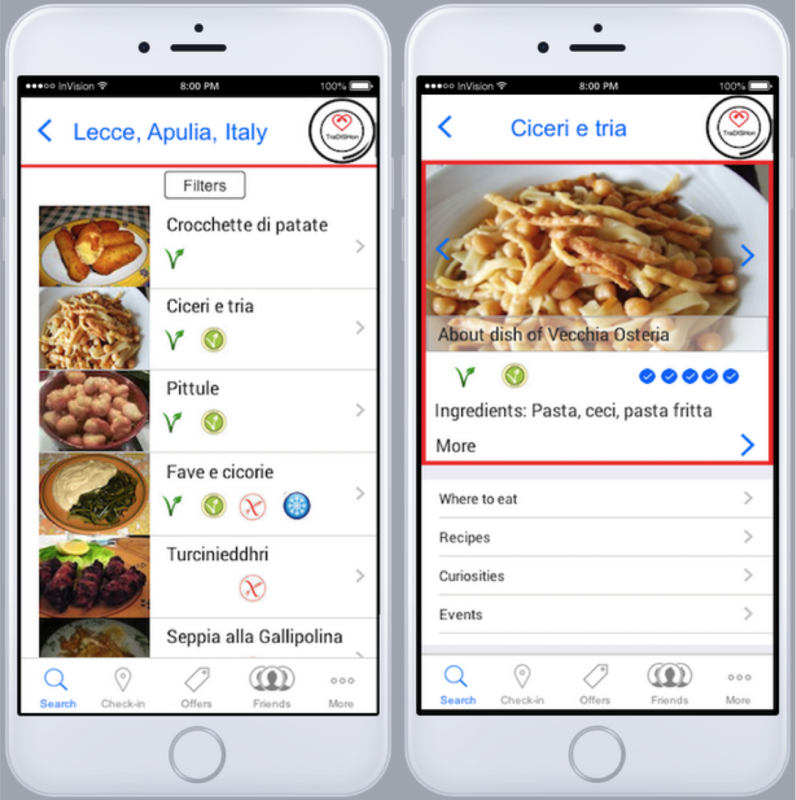 TraDISHon helps you to choose a dish from the culinary traditions based on your special dietary requirements, location and personal preferences. You can quickly find information about typical dish and the best place where taste it as suggested by the community. – feedback and dish ranking. The challenge is how valuable traditions and culture can be integrated onto a digital system on which users share and exchange information, traditionally passed by word of mouth amongst informal communities.